Whitworth University has landed once again on Forbes' annual rankings of the top undergraduate institutions in the United States. Whitworth joins some of the most prestigious schools in the country on the magazine's latest rankings, and it is listed as one of the top six private schools in the Pacific Northwest. The list is posted on Forbes' website and will appear in an upcoming issue of Forbes magazine due out later this month. The magazine, which says its rankings are consumer-oriented and emphasize financial prudence, bases its list on criteria such as quality of teaching and career prospects, graduation rates, and levels of debt upon graduation. The rankings are prepared exclusively for Forbes by the Center for College Affordability and Productivity, a Washington, D.C.-based think tank. Williams College, a small liberal arts school in Massachusetts, tops Forbes' list for the second year in a row, followed by Princeton University, West Point, Amherst College, Stanford University, and Harvard University. Whitworth is ranked No. 192 overall and No. 36 in the West, making it the fourth-highest ranked school, public or private, in Washington state. Other private schools in the Pacific Northwest that made the overall rankings include Whitman College (No. 36), Reed College (No. 92), Willamette University (No. 96), Seattle Pacific University (No. 181), the College of Idaho (No. 183), the University of Puget Sound (No. 246), Pacific Lutheran University (No. 269), Gonzaga University (No. 272) and Seattle University (No. 323). The complete rankings can be accessed online at http://www.forbes.com/top-colleges/. 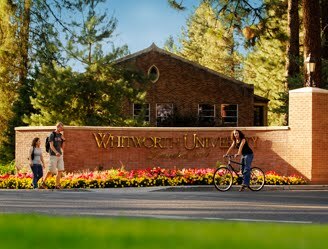 "We appreciate recognition as a 'Best College' by Forbes, particularly because their rankings highlight outcome measures that are important to students, such as student satisfaction, minimizing student debt loads and post-graduate success," says Greg Orwig, Whitworth's vice president for admissions and financial aid. "Whitworth is absolutely committed to those outcomes, regardless of rankings, but we welcome coverage in Forbes and other media outlets that highlight the achievements of our students, staff and faculty." Forbes' rankings are based on five general categories: post-graduate success, which evaluates alumni pay and prominence; student satisfaction, which includes professor evaluations and freshman-to-sophomore year retention rates; debt, which penalizes schools for high student debt loads and default rates; four-year graduation rate; and competitive awards, which rewards schools whose students win prestigious scholarships and fellowships such as the Rhodes, the Marshall and the Fulbright. Whitworth has a strong record of placing students in successful careers and top graduate programs. Recent grads include Sean McGuire, who received a $70,000 per year scholarship to conduct research while he's completing his doctorate at Princeton University, and Evan Cate, who is pursuing a master's in divinity at Duke University. Rachel Frazier received her J.D. from Harvard Law and is working as a Borchard Law and Aging Fellow in Washington, D.C. Meanwhile, Caleb Hug is completing his doctorate in computer science at MIT and will be working as a software developer at Microsoft. Whitworth has a three-year average freshman-sophomore retention rate of 86 percent, while 85 percent of students who graduate from Whitworth do so in four years; both of those measures are well above national averages. In addition, the university has lowered its student-faculty ratio to 11-to-1 even as undergraduate enrollment has risen. Whitworth will provide more than $35 million in grants and scholarships to undergraduate students this year, and the average financial aid award for Whitworth students receiving aid is $25,366. The average student debt owed after graduation for a Whitworth undergraduate is $18,801. To provide context, the average debt load at other Forbes-ranked private schools in the Pacific Northwest is $25,799 at Seattle Pacific University, $17,955 at Whitman College, $29,514 at the University of Puget Sound, and $27,750 at Linfield College. Four Whitworth seniors, a record number for the university, were awarded Fulbright English Teaching Assistantship grants for the 2011-12 academic year. In 2009, the Fulbright Program named Whitworth a top producer of students who received Fulbright awards in 2009-10. Since 2000, 15 Whitworth students have been selected as Fulbright scholars, and three faculty members have received Fulbright fellowships in recent years. Several Whitworth students in recent years have received the Barry M. Goldwater Scholarship, the highest award for undergraduate-student achievement in the sciences. Most Goldwater Scholars go on to Ph.D. programs where they continue to receive prestigious scholarships and fellowships for their graduate studies.